Is Google Introducing Major Changes To Organic Geotargeting? Well that subheading explains why Google introduced GWT Geotargeting. Major global websites often encountered major difficulties running sites on multiple ccTLDs, and global brands therefore had great difficulty taking advantage of Google’s geotargeted search results. 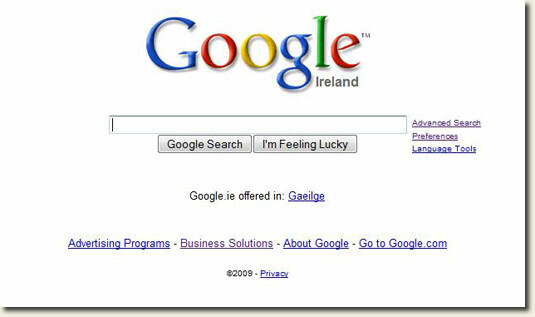 In late 2007 Google introduced a new tool that allows owners of gTLD (.com, .net, .org etc.) to geotarget different subdomains or subfolders of their sites to specific countries. This tool effectively allowed global sites to appear ‘local’ in Google country-level SERPs. I first wrote about the Geotargeting tool back in January 2008. Forward To July 2009 – Where Did Goetargeted Sites Disappear To? The Geotargeting tool within GWT stopped working sometime around the end of June. Or to be more exact, the effects of the tool were no longer visible, and sites using the tool no longer appeared in ‘Pages from’ searches in Google’s ccTLD properties (google.ie, google.co.uk etc.). As of the past few days geotargeted sites are once again ranking as they did previously, and it appears the tool is once again working as advertised. I initially believed GWT Geotargeting was broken, but now I’m more convinced that this was in fact a test. Why do I think this was a test? Well I’ll let you know shortly, so please stay with me as I work through some more background details. In late June reports of Google testing the ‘pages from’ control on their search front-end started doing the rounds in the UK and SA and NZ. I also wrote about Google testing ‘pages from Ireland’, and managed to see that particular test myself on 3 different computers (different accounts). Google confirmed that this was indeed a user-acceptance test for the removal of the ‘Pages from’ control option (see Jem’s response in this thread). But was Google running other associated tests? Google is obsessively secretive. Many would say excessively secret. When I first noticed country-restricted results no longer included GWT geotargeted sites I shot an email to Google. I received a fairly normal response – “Thanks. We’ll look into it”. As a contributor over on Google Webmaster Support Group I often ping issues I notice (very often these turn out to be non-issues – Google ‘features’, not Google ‘bugs’). Not unusually perhaps, none of the subsequent responses I received referenced the “bug” as a known issue. During this period the web also seemed bereft of discussion about the geotargeting tool not working (there were a few isolated threads on Google’s Support Group). Hush online, and silence from Google. Google rarely makes public details of snafus with its index. But they have, on occasion, come out publicly and said “this is an issue, and we’re working on it”. They didn’t in this particular case, even privately. Up until recently I still considered the geotargeting issue to be a bug, but some more pieces of the puzzle started to fall into place that made me consider the possibility this was actually a test. One particular response from Google I sawe struck me as odd. Some other inquiries about this were made. The canned response received merely stated that the affected site in question was correctly set up in the GWT Geotargeting Tool, and that “Google’s algorithm may change from time to time”. Something in this message didn’t quite add up. What I read (and I paraphrase here) was ‘you’re doing everything right – don’t change anything’, and ‘we [Google] may change how this works from time to time’. That response came from a less-direct support-type channel at Google, and again no mention was made that this might be a known issue. Being perfectly honest, the idea of a test hadn’t even entered my mind at this stage. Before I tell you what the final piece in the puzzle is I’m going to speculate on the possible tests Google might want to run, and why. Removing Geotargeting Tools – Who Would You Test? We know at least one test occurred – the removal of the country-restrict control – and we must assume Google is considering taking this out of their search interface. In order to conduct proper user-acceptance testing you need to test a sample of constituent groups affected by the change. So who would be affected by the removal of ‘Pages from’? Google’s search users obviously – and they were indeed tested. But who else might be indirectly impacted by removing ‘Pages from’ option? There’s actually only one other major group apart from searchers – users of the GWT Geotargeting Tool. And with this group there’s a catch – you cant easily run acceptance tests on them. Did Google Test GWT Geotargeting Tool Removal? The first thing I should state is that this is merely speculation on my part. I’ll state the “facts” as I saw them and let others draw their own conclusions. Around June 27: Google stopped including global websites geotargeted web content in ‘Pages from’ searches. It took a few days before everything fell out of the indices, but this may be normal across DC infrastructure. The change removed everything – even brand names no longer showed up. I started watching a number of very large global sites I knew used the Geotargeting feature. All were gone from searches using ‘Pages from’. I figured this was a bug. Late June: First mentions about testing ‘pages from’ control. First weeks of July: I made a number of inquiries about GWT Geotargeting Tool which led me nowhere, and I also saw the canned response about Google algo updates mentioned above. End July: Geotargeted sites reappear in country-restricted searches on Google ccTLD properties. Let’s return to the speculation again. 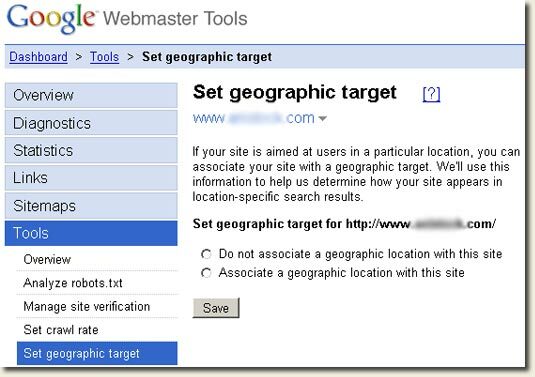 Google wants to test the removal of the Geotargeting Tool in GWT. They can either test removing the tool from the GWT interface (and this may also have occurred) or they can test of the main outcomes of such a change – remove the results from country-restricted SERPs. Let’s take each of those in turn. I have a sneaky suspicion there are some serious problems with acceptance-testing the removal of Geotargeting Tool within GWT. I assume most users of this tool rarely check it once they save their settings, so the only test responses you’d likely get are from new users. That’s not ideal given that many large enterprises have already implemented the tool, and therefore a test would likely miss their response. That said Google may have tested this, and it may also be a valid test. Removal of their sites from country-restricted searches is likely to go unnoticed by many site owners. How many SEO teams regularly monitor country-restricted searches in depth, and what analytics tool lets you drill down by country-restricted search referrals? The population of GWT Geotargeting users is minuscule next to the population of searchers, so a sampling action may not gather enough data to be significant. One thing we can be sure of – removing the geotargeted sites from country-restricted searches was not designed to test search users. The ‘Pages from’ interface test would cover most hypotheses around searcher response to removing GWT Geotargeted websites, and if Google was testing search users they would only need to sample a tiny fraction of searchers to yield statistically relevant results, so why make change for entire population?. So Just Who Was Google Testing Then? There’s an assumption that site owners will notice the change during the test period, and therefore removing GWT Geotargeted sites from SERPs might still not yield valid results. You see, you’re basically testing the reactions of the target group (site owners) based on the changes that they may or may not see (of course maybe that’s what the test was all about?). The fact that the complete population was tested (all GWT Geotargeted sites appear to have been removed for all users in restricted-country searches), and not a sample, also reinforces my belief that this was indeed a test, and that the test subjects were site owners not searchers. How Long Would Google Run A Test For? I mentioned that I initially thought the GWT Geotargeting results issue was a bug. I now believe this was a test. The ultimate confirmation for me was the dates – almost exactly 1 month passed between first reports and a reversion to the original states. That’s give or take the time it may have taken for me to see it at my various locations during the test period. Google likes to test for 30 days/1 month, and this combined with various responses I’ve received and seen justifies, in my mind anyway, the possibility that Google was also testing GWT Geotargeting Tool removal. One Last Question – Is There Something Bigger? Here’s the real question I’m interested in answering – Google appears to be testing geotargeting in the grander sense, not just the interface and GWT Geotargeting tool, so what’s likely to come down the road? In my Future of Geotargeting post I alluded to a possibility that the GWT Geotargeting Tool may be retired soon. I still feel this may happen. The country-restriction control on Goole’s search interface may also soon go away. But I now think that these multiple tests are part of something bigger, something that may involve a sea-change in how Google handles organic geotargeting. The worst case scenario is that ccTLD will play a greater role, but my gut tells me Google is far too clever to go backwards, and that something very new might be about to enter the mix. Could I be wrong? Absolutely. Should you be concerned about this? In my opinion, YES. If I’m right these forthcoming changes will impact a huge number of websites and site owners. I’m afraid we’ll all just have to wait and see what happens. If you think this post might be useful to others I’d really appreciate if you could help spread the word – twitter or blog about it to let others know. I’ll be watching this carefully so subscribe to my feed or follow me on Twitter (yep, I might actually start posting there) if you want to be the first to find out about future Geotargeting changes. Thanks for dropping by again. Hopefully you’ll post anything odd you come across – seems to be a lot of activity these days, likely in response to Bing, who seem to have rattled Google somewhat.